EcoSmart Energy Management Company Limited is specialized in renewable energy engineering and energy management.Our management and technical team consists of a number of senior engineers and energy specialists who have rich experience in the field. 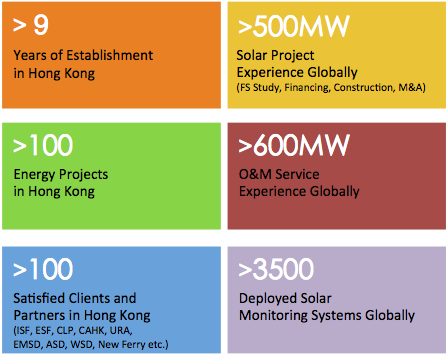 We are located in Hong Kong, but not limited to the local market, engaging in consulting and engineering business. With our professional team, we are dedicating on providing Total Energy Management Solution, energy improvement and conservation plans for our customers. In order to promote the wide range and variety of renewable energy products and enhance energy efficiency in the society, we leverage our strengths and expertise to provide customers with “one-stop service” including product design and development, project design, construction and installation. With the mind “Making a green world, for our better life” as EcoSmart’s our goal, we are dedicating on developing and promoting Green Energy and to bring renewable energy to the community. We have participated in the reconstruction project after Sichuan earthquake in 2008 and was awarded the “Outstanding Green Excellence Awards” presented by Capital magazine in 2010. We look forward to your joining with us to build a wonderful green world.